Okay, so posting a little late but yesterday was a bit hectic! I got into work late because somebody decided to throw themselves under a train at Victoria Station. Now, whilst I have enormous sympathy for anyone who feels that life has got so desperate that they need to end it in such a devastating fashion... I can't help but feel anger towards them at the trauma they subsequently cause a) the poor train driver who has to helplessly witness someone hurling themselves in front of his/her carriage with the full knowledge that there is nothing they can do to prevent their demise. And b) any other commuters on the platform who are forced to watch someone perform such a horrific act of suicide - it can't be pretty!! This took place before 10 am so it was still the rush hour, and Victoria is one of the busiest stations in London! BUT it did mean I was very late for work, so had to work through lunch, which meant I didn't get to do my lower body workout FUME! The boys and I went to see Chun Yi - The Legend of Kung Fu at the London Coliseum last night. Before we got there we had a quick bite to eat at Henry's in Covent Garden. I'd seen on their site that they had a special deal which entitled 2 people to a burger or pasta dish each, plus a bottle of wine to share, for just £20! Result! So, Joe and the boy had burgers, the boy had a diet coke (a treat, he's very rarely allowed anything like that, I'm such a mean strict mum haha) and Joe and I shared a bottle of the house red which was actually the most delicious Malbec - my fave! I was going to get steak and chips, sans chips, as I fancied a good steak and I'm a sirloin fan. 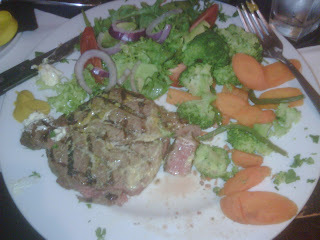 However, they'd run out of sirloin (although they had enough for a steak sandwich, bizarre! ), so I had to opt for the 12oz rump steak instead... even though I knew it was a fattier cut, and about £6 more expensive!! My main course was nearly as expensive as the boys' burger, chips and our bottle of wine! OMG it was sooo good! I have been trying to get a decent steak for weeks now. I was so disappointed by most of the steaks I had in France... especially on the last night when it was just basically ribbons of fat, grr. This was lovely though, not much fat and it was almost exactly how I'd ordered! I always go for rare, with the knowledge that it won't ever be quite so - but the lovely chefs at Henry's got it pretty much spot on! I swapped my chips for veg which meant I got some broccoli and carrots - nicely cooked too, nice and firm, as well as a pretty decent side salad too. After our delicious meal we legged it to the theatre only to arrive just as they were pulling across the cord over the door - so we couldn't get to our great stalls seats and were banished to the balcony for the first half. I was livid! Thankfully the Coliseum isn't as vast as the Theatre Royal where I once paid £5 for tickets to see The Producers and ended up spending the whole time squinting at the tiny dots on the stage and feeling sick from vertigo! (or whatever the realterm is for being afraid of heights). So, Chun Yi... well, I'm glad that I didn't pay top whack for those tickets or I'd have felt a little aggrieved to say the least! I'm not sure what 'legend of kung fu' it was meant to be... I certainly didn't learn anything about that amazing martial art! The story was the weakest, most paltry sappy thing ever. The 'young boy' who was accompanying the older Chun Yi while he narrated the whole thing was so obviously not singing the lovely high-pitched melody that kept being played at various intervals. For one, his voice had broken!! So that was a bit insulting, they could have just played the song and not had him mouthing away as if it were him singing, just looked daft, even from the balcony my son could see he was miming! Then there was Chun Yi himself... at first played by a young boy (the boys were excellent by the way, so flexible and agile, amazing! ), then a young man. The thing is that they kept changing the man playing him, at one point Chun Yi looked like he'd piled on the pounds a bit! I'll try and post later but I've got quite a busy day ahead. I'm leaving work at 2pm as I've got a mammogram and blood test later - scary! My great Aunt died of breast cancer and my Mum, who's very young still, had a very aggressive form of it a few years ago which ended up metastasising into her brain causing tumours and a terminal life sentence. Then I'm going to look a few places in East Dulwich with a good friend of mine. She's been living in Fulham for the past few years, which was very handy when I lived in Chelsea as she was only down the road! Now I'm in SE London it's a bit more difficult to see each other so if she moves to East Dulwich I'll be super super chuffed!! Anyway, must get on, hope you all have a fabulous day. Sounds like you had a great night out and the play sounds hilarious! Do you find that the Promax Diet bars have an odd bitter taste to them at all? Compared with the "normal" Promax meal bars, I do and I was thinking about starting to add in a Promax Diet shake for breakfast but if they taste bitter too it's going to put me off. What do you find? that's probably what gives it the aftertaste, not that I've really noticed it but I don't really like the dark choc flavour as much as the choc and orange and I'd assume it would have a bitter taste because it's dark chocolate and orange? I'm quite tempted to try the normal promax meal bars now, maybe I could order some for my other half and nick a few, haha! Thanks for that; I've taken the plunge and ordered a couple of different flavours in mini tubs and I'll see how that goes (oddly, Amazon are selling Maximuscle stuff quite cheaply, so they'll arrive tomorrow! yay!). Not sure I'm mentally ready to swap my cereal for a liquid brekkie, but I'll give it a go on gym days at least and see how it pans out. Reckon you're probably right about the bitter taste in the Diet bars coming from the green tea and/or orange flavouring. I'm thinking there might be something else in those bars that either my body doesn't like or isn't used to as the day after my first one I was quite jittery - could be co-incidence as it was quite a stressful day, so we'll see how I am after today's post-gym one. cool, let me know how you get on with your flavours! Make sure you use one of their shakers to get all the lumps out - unless you've got a blender? you don't really have to swap your brekkie - I only drink/eat promax diet for breakfast because I never ate breakfast before... and even now I'm still finding it hard to force myself to eat that early - in fact I'm just having my 'breakfast' shake now... at 10 to 11 - bad!! You could always have a low cal breakfast, then a promax diet shake as a snack at say 11? it's the caffeine in the bar that's making you jittery! make sure you don't take any promax diet products too close to bed time, they'll keep you awake! My banana and chocolate just arrived and I was planning on having one later but there's no scoop! I kinda ssumed there's be a measuring scoop in the tub, but there isn't. Hm. So 60g is a portion and a tablespoon is approx 15g of dry things... I'll improvise with a tablespoon for today but seeing as I'll not be taking the tubs home (don't want hubby to know about is just yet) I'm a bit stuck as to how to measure with any accuracy (no scales at work either). How do you do it? Oh I almost forgot, no jitters today so it must've been a co-incidence. Yay! if one tub didn't have a scoop but the other did you could always use that? Aha! Yes! Much rummaging around produced a scoop. Phew! Now I have crunchy bits under my fingernails :o) Aaaand banana and chocolate tastes pretty good! Yay!